Abbeydale is the first event we have ever run in Sheffield, a city famous in the racketball world for 3 large clubs all within a few minutes’ drive of each other, Abbeydale, Hallamshire and Fullwood making it was a predictably large turnout for the event. The club also houses one of only three all glass squash courts in the UK and we were lucky enough to be able to use it for the tournament adding another dimension to the event and resulting in some great photos! The tournaments no.1 seed and victor of the Series event in Chapel A back in July Matilda Parslow made it through the group stages without dropping a game. 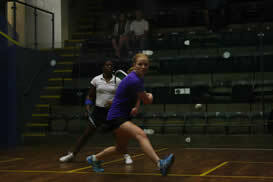 However it was a tough battle for second place with Juliana Caines defeating Anna Brown 2-1 on the glass. Emma Stallworthy came through with 6 points but Sally Merchant fought her close. Chloe Widdowson narrowly defeated Elaine Gilchrist 2-1 in the contest for 3rd. Series veteran Jo Moseley made it through against Laura Morris and Christine Baldwin to earn her a place in the finals for the 6th time this Series. Moseley had to fight hard to make it past Stallworthy but her determination and competitiveness saw her through to set up another final against Parslow. It was a replay of the final at The Manor and Chapel A, with the score at one encounter a piece for the two at the top of the ladies Series rankings. Parslow is improving quickly though and despite battling as she always does and getting a tremendous number of balls back Mosley could not compete with Parslow’s accurate hitting. In the end it was 2-0 Parslow adding to her list of titles. In group A Stewart Lowth came close against Mathew Burnley and managed to just stay ahead of Serge Mbikina coming through in a close 2-1. In the end the group was decided by a contest between Daniel Conway and Paul Devey with Devey coming through 2-0. Chris Jones just managed to sneak it against Ben Lee in Group B before being defeated by Jamie Hissitt. The group was won by Ed Smith who managed to put his years of squash practice into play on the racketball court. In the final Smith controlled the play from the start and despite a great effort from Devey who had already played 4 matches that day he never looked like being denied the Abbeydale title. Smith is an experienced squash player with his take to racketball on the day showing just how easy it is to cross over between the two sports. He might be a contender for one of the Over 50’s competitions soon. In my opinion this was the toughest A grade we have yet seen in a UK-Racketball Series! Paul Norton once again proved a tough opponent for Dom Hamilton in the opening group A match. The two players have met a couple of times already in the Series this year and it is always a contest. Only a couple of points in it again but this result took Hamilton to 33 matches unbeaten and he looked in no mood to give his run up just yet. The other competitor in the group was local racketball junior Oliver Turner, he played fantastically well at his home club, almost taking Hamilton and then overcoming the experienced Norton 2-0 in a display of dynamic retrieving. In group C Elliot Selby defeated rankings climber Craig Chappell 2-1 with both overcoming local Abbeydale player Adam Turner in long matches. In the finals group it was a battle between 3 racketball titans. Hamilton undefeated in the Series. Selby climbing the rankings quickly and Jeal probably one of the most exciting players in the country with his unique blend of attacking racketball. The opening match was set to be the closest between Hamilton and Jeal. Hamilton took the first before Jeal clawed it back to set up the decider that everyone wanted to see. It was neck and neck all the way with the brutal rallies taking it out of both players but in the end it was Hamilton who looked like he had to force the issue first and Jeals counter attack proved just too consistent and strong with him taking the match 11/9. Hamiltons run of 34 unbeaten matches came to an end but without hesitation he went to congratulate Jeal on the victory, a fantastic advert for how racketball should be played, Hamilton will remain a UK-Racketball legend! The group was decided by the contest between Jeal and Selby on the glass count. It was close with many suspecting that Jeals earlier battles first against Widdison then against Hamiton might have taken something out of the 2009 Nationals Finalist but it was not to be. His attack worked well on the glass and despite Selbys best efforts against the tide in the end momentum was all with Jeal today and he made the most of it. 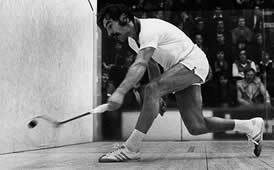 His first UK-Racketball Title but I suspect not his last. In the group stages all seeds made it through except for the on paper surprise result from Nigel Millington who was defeated by Peter Fielding in his opening match. On paper it was a shock but in reality Millington has been out injured for a while, whereas Fielding has played the last couple events and is looking in good nick. 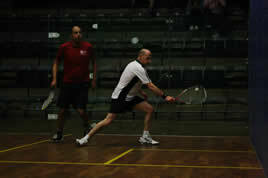 The first semi final was comfortably taken by England Number 4 Paul Haigh. The second semi was a battle between Michael English who had incredibly made it to the Semi Finals in both the B and Over 50’s meaning he had to play both Semi Finals back to back. With English already having played 8 matches before this one even began, you would have been forgiven for thinking it was going to be a foregone conclusion but he kept going right to the end forcing Malkani to win every rally to earn his place in another Final. The final was a tough but Haigh is playing very clever racketball, moving the ball around well and following up shorts by anticipating well after he has applied pressure, in my opinion he is the over 50’s man to beat at the moment and very dangerous on a racketball court. Haigh 2, Malkani 0. Jason Russell maintained his run of form in group A coming through without dropping a game. In group B the brutal opener between Neil Baldwin and Dave Lord ended the England no.5 Lords day forcing him to withdraw injured. It was probably one of the hardest fought opening matches ever in a UK-Racketball competition and could easily have taken place in the final. In group C Jason Fearn from Brampton Manor in Chesterfield made it through to the Semi finals comfortably. In the winners group Neil Baldwin first took down Jason Fearn in a hard fought match. Fearn gets everything back and moves the ball round to wear down his opponent but Baldwin managed to find enough winners and changes of pace to keep Fearn out of his rhythm to set up the tournament deciding Baldwin-Russell match. It was tight battle right from the off. Russell had already won 2 events year in Ilkeston and Devon but despite coming close he had not claimed a title since June! He looked determined today (not that he doesn’t always...), he was getting everything back and putting pace on the ball at every opportunity, in the end despite pushing to the end Baldwin did not have enough. He had already had two tough matches that day but sometimes that is just the rub of the green with Russell certainly having his fair share of tough draws this year as well. It was a strange tournament in the B field. With so many entries and a plan to stick to groups of 4 wherever possible it made for an interesting climax with 4 players going through from 5 groups. This meant that every game and every point counted in the group stages. As you can imagine there was no mercy, not a game was dropped by any of the group winners and in the end it was unlucky Nick Bond who didn’t make it through missing out by only a handful of points. 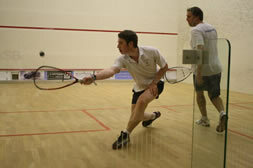 The first semi final was taken by Andy Wood against in form James Healey from the Manor. In the second semi Michael English was again denied a place in the final this time by Mark Burnley. The glass court battle for the B was eventually won by Wood who was too solid for a tiring Burnley. A big thank you from myself, Will and Hannah for making Abbeydale another fantastic tournament and bringing to an end the events for 2012 in the North, only 2 left this year now, on to Chichester. Abbydale is steeped in squash history with the club playing host to the British Squash Open from 1969 to 1974 and witnessing some of the amazing Jonah Barrington Geoff Hunt clashes including their famous 1972 match which saw Barrington winning 9/7 in the fifth and Hunt having to be carried from the court to the changing rooms. With 8 courts the club is still one of the UK’s most prestigious venues hosting the British Open Junior Championships (one of the biggest junior tournaments in the world) every January. Sheffield itself is one of the UK’s biggest racketball hotspots with Abbeydale close to both Hallamshire and Fulwood both large racketball centres in their own right which means the event is set to become one of the most popular on the tour. The club has one of the countries only glass back courts, which uses a white rather than black ball (we will be looking forward to getting some fantastic action shots for our facebook page). There is a large car park which I have never know to fill up, a great bar, lots of other sports to watch (rugby, cricket, hockey) as well as a sauna for after your matches. Also any player who might be thinking they are too old to still be competing for titles should remember one of Barrington’s most amazing accomplishments, winning the British Nationals at Abbeydale at the age of 40! When interviewed at the Super Series finals in 2012 he commented “I really wish I was in this final, I know that sounds crazy but I really do”. This will be the clubs first major racketball championship and will hopefully become a regular feature on the tour, get your entries in now to avoid disappointment. There are 7 squash courts. One is an all glass court, 2 are glassbacks and 4 are hardbacks. All the courts are maintained to the highest quality.